Meat In Thai markets, meat is often sold in the open air. No refrigeration. Sometimes the vendor moves a small broom to frighten the fly. 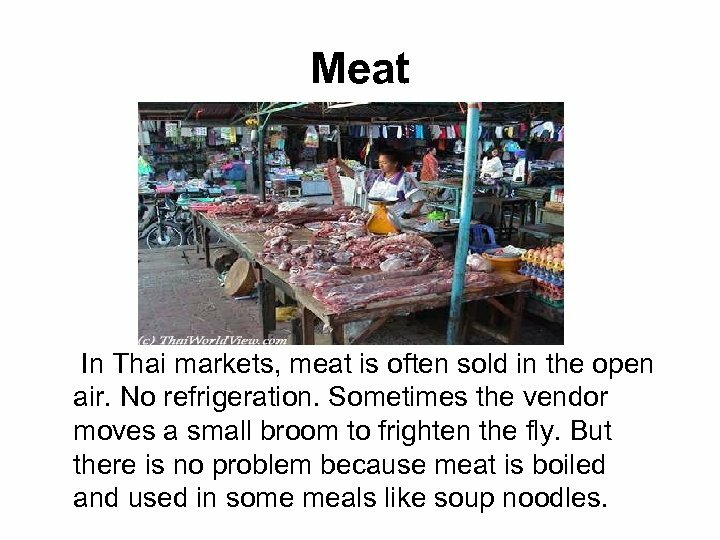 But there is no problem because meat is boiled and used in some meals like soup noodles. 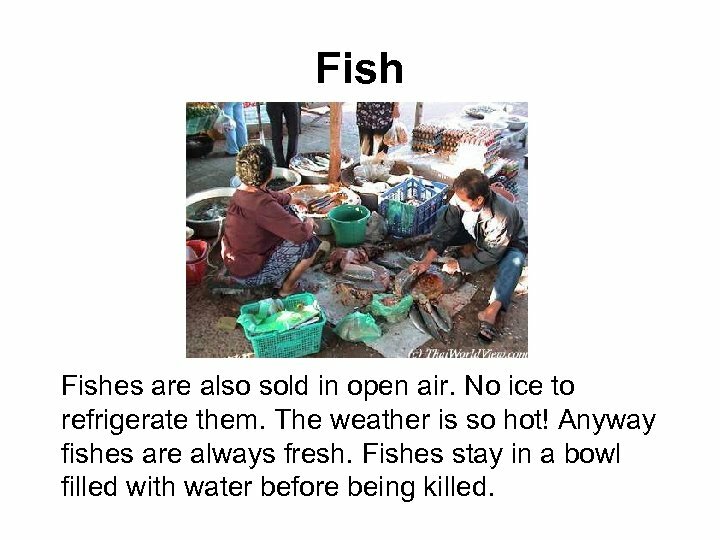 Fishes are also sold in open air. No ice to refrigerate them. The weather is so hot! Anyway fishes are always fresh. Fishes stay in a bowl filled with water before being killed. 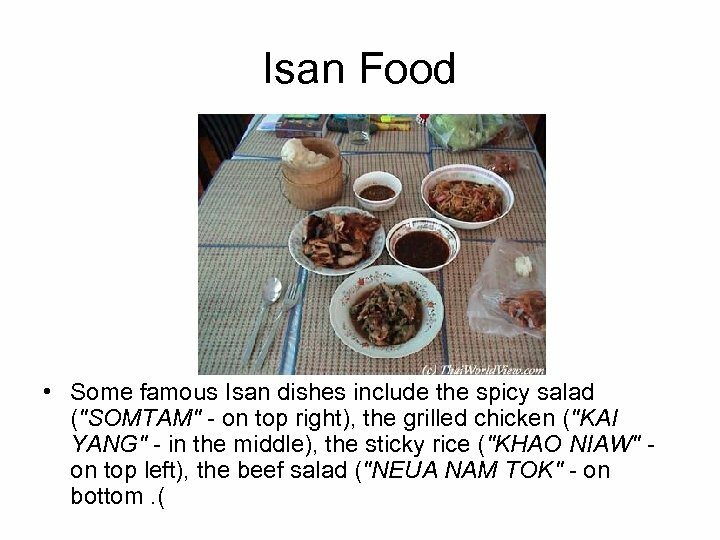 Bugs In "ISAN" area markets, it is possible to eat bugs like scorpions, grasshoppers, larva, beetles and even sometimes dogs. These days, farmers are making more by harvesting lice than rice. Now Bangkok residents also appreciate eating bugs. Canned grasshoppers, locusts, water beetles, crickets, silkworm pupae and ant eggs are available at the supermarket. 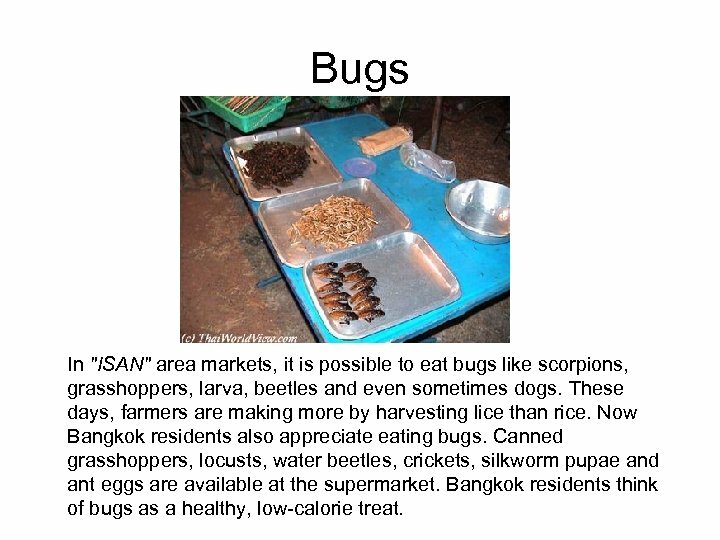 Bangkok residents think of bugs as a healthy, low-calorie treat. 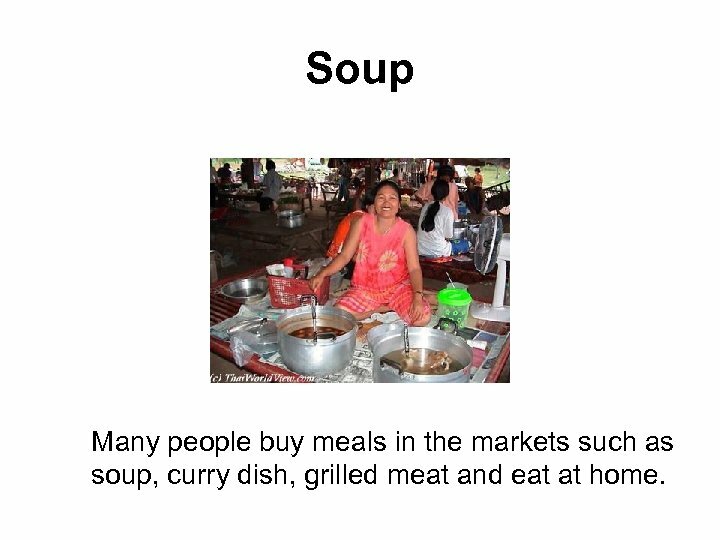 Soup Many people buy meals in the markets such as soup, curry dish, grilled meat and eat at home. 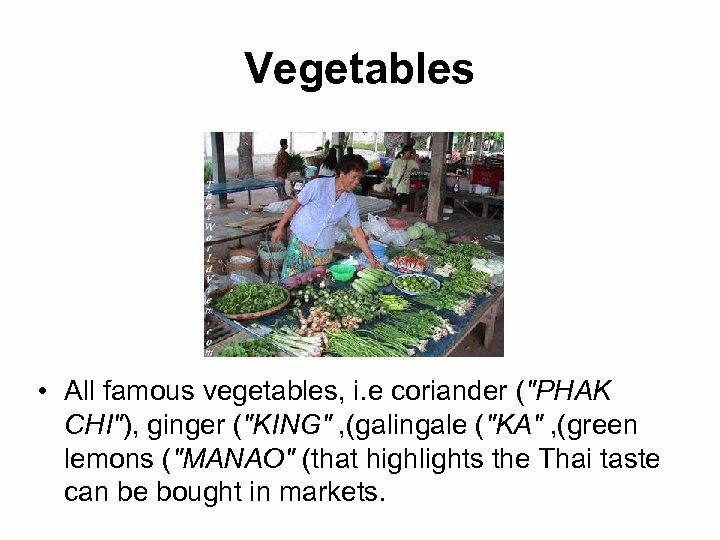 Vegetables • All famous vegetables, i. e coriander ("PHAK CHI"), ginger ("KING" , (galingale ("KA" , (green lemons ("MANAO" (that highlights the Thai taste can be bought in markets. 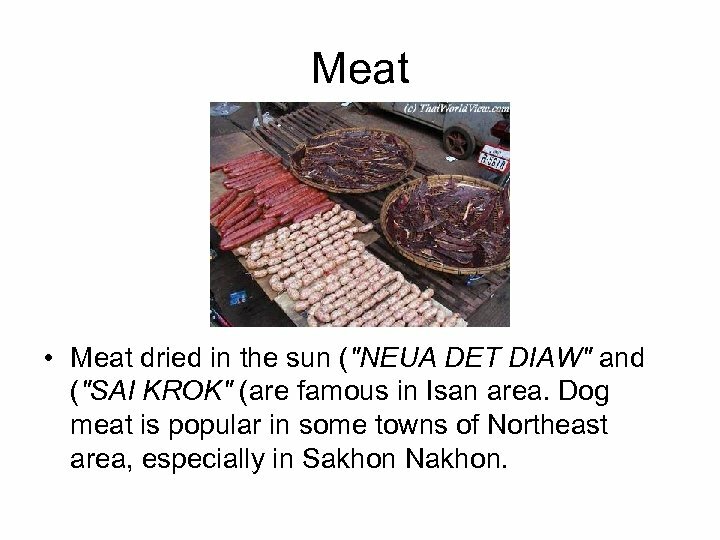 Meat • Meat dried in the sun ("NEUA DET DIAW" and ("SAI KROK" (are famous in Isan area. Dog meat is popular in some towns of Northeast area, especially in Sakhon Nakhon.